"Look at that dad," said the small boy who gripped his father's hand. The young boy's face looked upward as he and his father stood hand-in-hand in the train yard, watching as the larger-than-life #1702 locomotive was maneuvered to the leading end of the train. The child pointed to the majestic steam engine, spouting dark smoke to the sky. "I want to ride that one," he said eagerly. "Not today," his father said sadly. "We're riding the diesel. We couldn't get tickets for that one." It was unclear who was more heartbroken; the child or the father. It was then I realized that it wasn't about riding a train; it was about riding a train being pulled by a steam engine. Therein lies the magic. Rivers and rails have always defined the Blue Ridge Mountains. The same is true of this intimate mountain town of Bryson City, North Carolina. The power of the Nantahala doesn't run through the town's downtown area, but close enough to be the town's source of enticement. It is nature's gift to the mountains, this rushing river that carries people on its back down miles and miles of a carved riverbed. As the temperatures rise, so do the number of people in rafts and on its edges; in the fall and winter, the river is alone, recouping itself in order for its numbers to return in a few short months. In the heart of the city, you will find the rails where The Great Smoky Mountain Railroad lives. This fall, there's a new energy drawing lovers of trains to hop aboard. Rails came to Western North Carolina in the late 1800s which opened opportunities of which people had only dreamed. "Baubles and doodads" became more than something others enjoyed; women could touch and own things that they had only heard about from others. The small mountain hamlets were seamed together by rail, and passenger service was robust at the turn of the 20th century. However, by the mid-1980s, with the passenger service discontinued as of 1948, freight traffic had begun to decline. Lines were closed; North Carolina purchased the Dillsboro to Murphy tracks simply to keep them from being destroyed. In 1988, the Great Smoky Mountain Railway was born. With the Dillsboro to Nantahala route being the most scenic, excursions took off. Hundreds-of-thousands came to observe the mountains from a different vantage point, at a different speed. 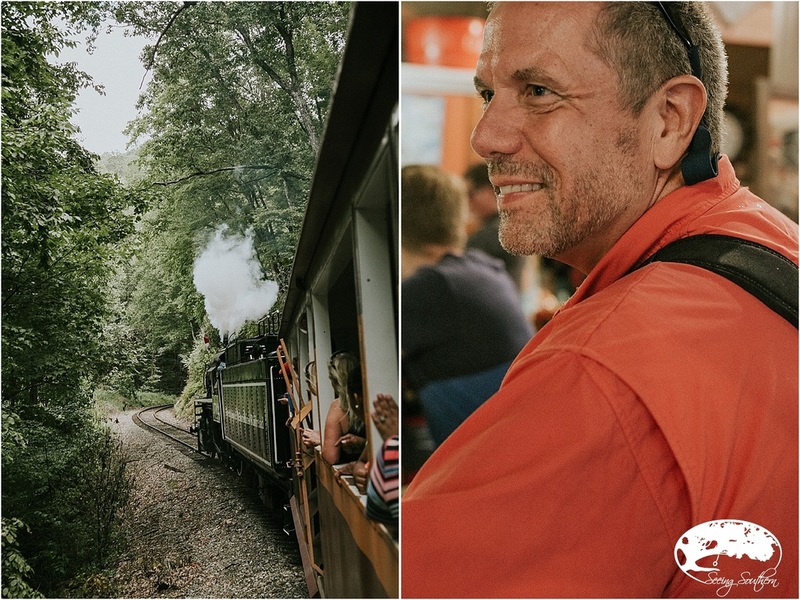 Now as the Great Smoky Mountain Railroad, it's majestic presence and nostalgic sounds have gotten sweeter. Originally built for European service during WWII, this S-160 class—dubbed the #1702— was part of the largest class ever built - 2,120 locomotives in total. Forgoing its European service, it remained stationed at Fort Bragg until it was sold to an Arkansas railroad. After many owners, it was finally taken out of service in 2004. Not having run the rails for 12 years, it's decline was more than cosmetic. Its restoration project began in 2014 when the Swain County Commissioners and the Great Smoky Mountain Railroad joined forces. 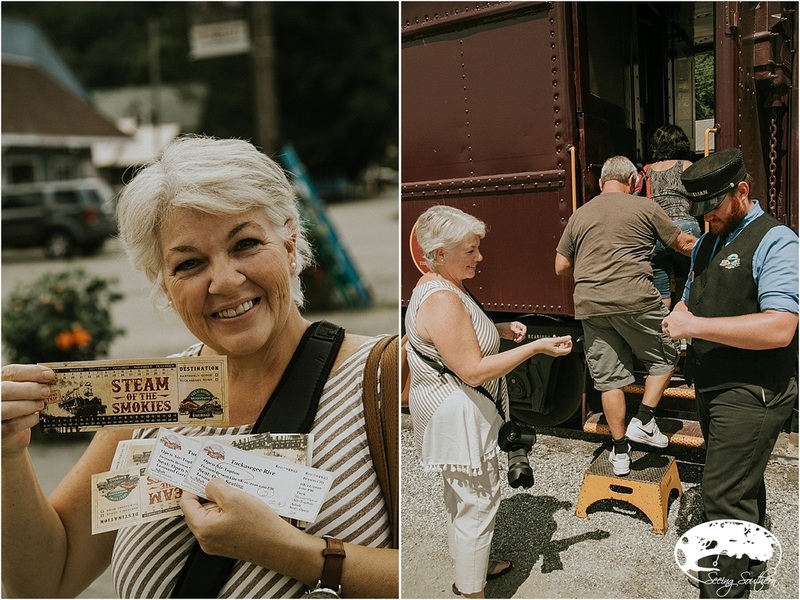 And finally, on July 21, 2016, a steam engine took back the lead, ushering cars of travelers and hometown folks, on what will be its two runs along the Tuckasegee River and the Nantahala Gorge. The #1702 specifically, whose impending resurrection had left the entire Blue Ridge Mountain family anticipating something great, did not fail to disappoint. 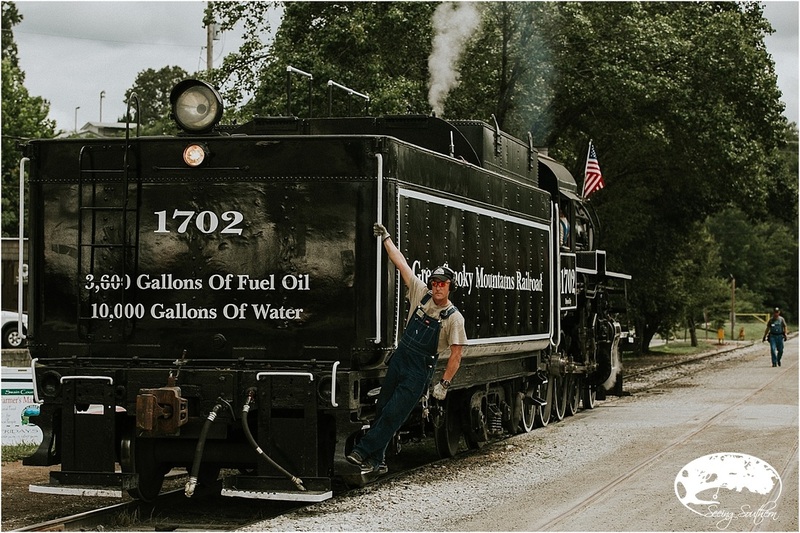 Steam excursions now depart the Bryson City Depot offering a first class experience or one a eye-popping open air gondola journey. The Tuckasegee River route moves riders through the mountains into the tiny town of Dillsboro with a short stop for shopping and eats and then back to Bryson City through the Cowee Tunnel and along side the famous set of The Fugitive and Harrison Ford's dramatic bus escape. The Nantahala Gorge route winds through the mountains, over the Fontana Trestle across Fontana Lake and into the gorge. 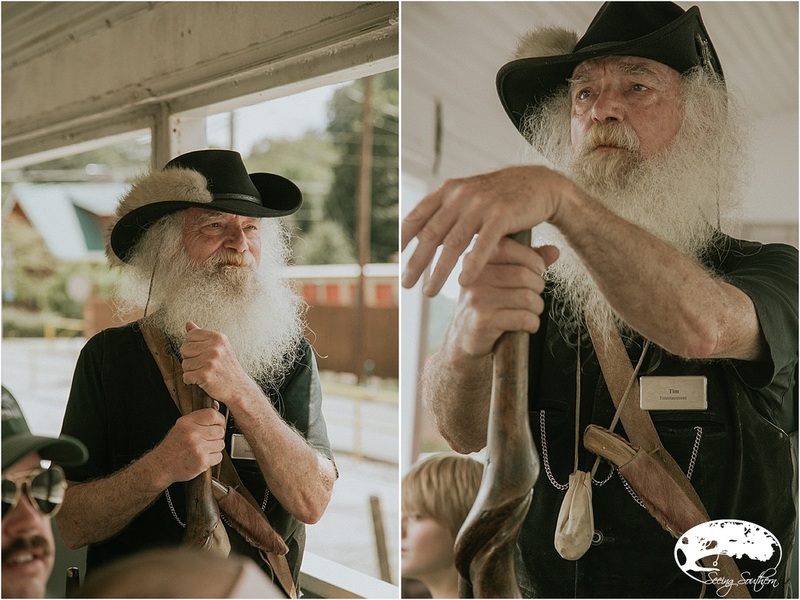 Along both routes, passengers experience history as storytellers wander from car to car, sharing stories of boarding houses of days gone by as well as farmers and businesses who have remained fruitful—just outside the window—in these small Blue Ridge communities. On the Nantahala route, you'll pass the Nantahala Outdoor Center and watch rafters experience the river's wild waters. 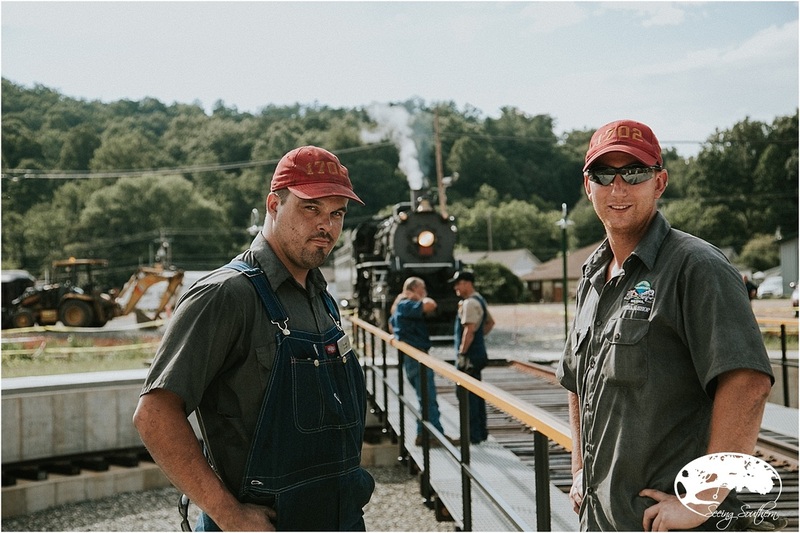 For the Great Smoky Mountain Railroad, pride is a constant state of being. "I am extremely proud of all the work that has been put into this project," says Sarah Pressley, marketing manager for the Railroad. "Knowing that these guys have sacrificed to see this engine restored is a true testament to dedication and a great work ethic. This is a monumental occasion for the Great Smoky Mountain Roadroad. We have been waiting for a long time to see this come to fruition, and we are excited to see our community and fans rally around the return." 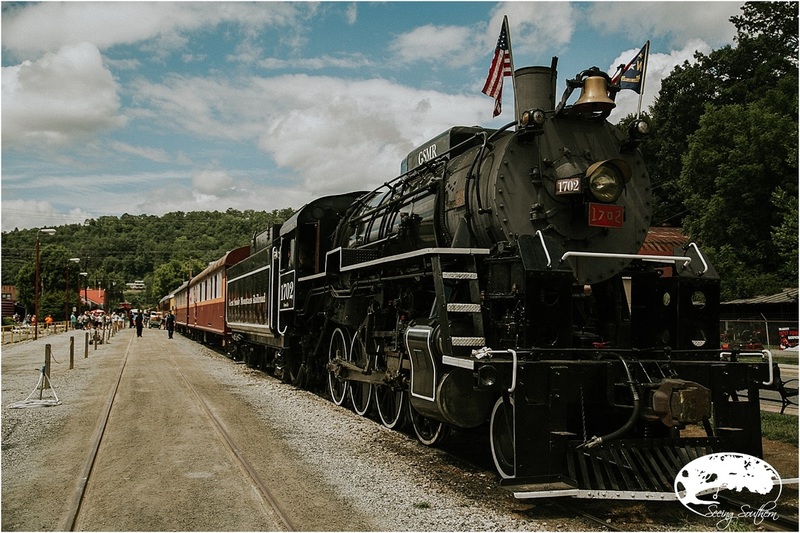 No matter which route you take or how old you might be, train travel—specifically steam engine train travel—brings out the childlike wonder in everyone. For the rider, it transports you out of a technological, modern era to yesterday, when simplicity and hard work defined every man, not smartphones and driverless cars. Chugging along the tracks, the wind whips through your hair, and your mind clears. The whistle's announcement as the smoke rises coaxes you into the journey mindset, regardless if your only traveling 32 miles. Then you realize, it's not the train; it's the steam. For steam is a living thing; it hisses and moans and whistles and propels you along. And as you pass intersections, cars are parked and empty. People line the crossings, arms waving, cameras raised. The train is coming, almost like a friend they haven't seen since last Christmas. As an observer, it's a romantic notion that reminds you of where you came from and for a little while, you can have it once more. The #1702 was a World War II work horse, dating back to 1942 when it was commissioned. One of the world's largest engine classes, it is one of two remaining in the United States. Who do you get to restore a steam engine? 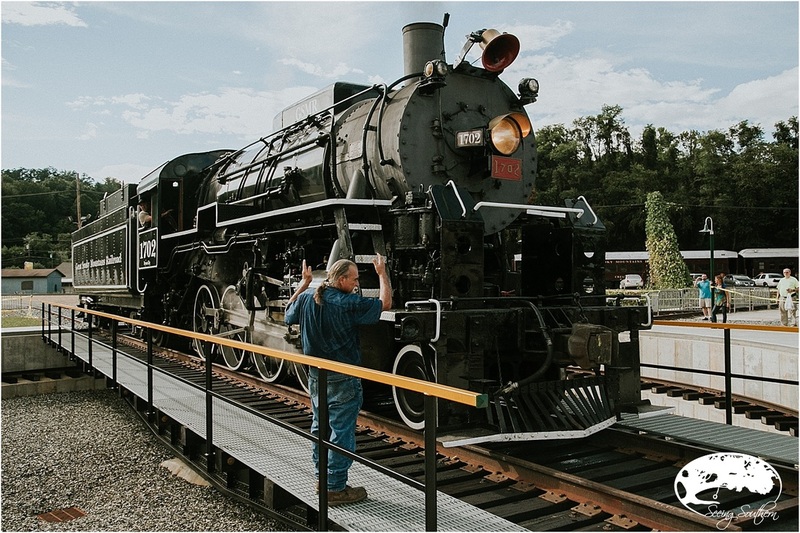 The official restoration began in May 2014 under guidance of Project Manager Steve Jackson and the boiler contractor Robert Franzen of Steam Services of America. With a shop built just for her resurrection, the #1702 arrived in Bryson City with great expectations. And that's where Brian Brooks, 31 of Sylva, and Marshal Harris, 22 of Mills River began to take it personally (lower right). Both welder fabricators, they led the charge of restoration. Marshal: Both Brian and I are fairly new to the railroading industry, but not new to welding. We are young, mold-able and knowledgeable, so we are easy to train and eager to learn. I also think the fact that I am very interested in steam locomotives had a lot to do with the Great Smoky Mountain Railroad's interest in me. I'm pretty enthusiastic about this stuff! Brian: This was a new exciting challenge that I was willing to jump head first into. I am also a local, lived here all my life, so I was looking for an opportunity this close to home. What was the engine like before you began? Marshal: Rusty, empty, full of holes! That boiler "wouldn't hold shelled corn' as they say. The first couple of days working with the engine I felt a little lost and unsure of just what was in store. Brian: It was a bit overwhelming! Your specific job was to rebuild the boiler - which is the locomotive's power source. Any bumps in the process? Marshal: On my first day, they specifically told me to weld the stay bolt holes on the boiler, which there were a lot. The boiler itself was in pieces. [We] working with contractors from Steam Services of America to rebuild the firebox, roll tubes, driving stay bolts, welded sheets . . . that's the tip of the iceberg! Brian: There was so much to be done even before we started on the boiler. The steam shop had just been constructed, so we started out in a fairly bare shop. I'm pretty particular when it comes to how I keep my work space (shop), so I'm usually the one focused on making sure it's all in order. Our main priority was the welding and fabrication of the boiler. Joe Steward, our shop machinist, lathed all the parts necessary. We did have some obstacles, but none that we weren't able to overcome. The biggest hurdle was the timely arrival of materials. We were up against a deadline. Most boiler restoration is done in steps, so we needed to keep ourselves on track, always moving forward to the next stage of work. Marshal: The biggest hurdle didn't appear until our first test run before we went into passenger service. We found that a bearing was overheating while we were taking a test run to Bryson. We discovered that the right rear #4 driver wasn't getting any oil to the bearing which caused it to overhead. Brian: You never want your bearings to overheat. This causes major issues with the operation of the locomotive and can leave the engine stranded. Luckily, we discovered the problem in time and it was quickly repaired to prevent any damage. And how do you feel about steam engines and the railroad? You're both quite young. Marshal: The love of steam locomotives came from my grandfather. I used to stay with him quite a bit when I was younger and he lived close to the railroad tracks. I remember there was a train that would pass the house daily, and it was always a treat to run outside and watch the train. My memories are pretty vivid of us talking trains. He shared his passion for trains with me, and I guess it just stuck. Brian: I grew up here in Dillsboro, very close to the railroad. It has been an integral part of this community since the 80s, so it always felt very familiar to me. I never imagined that I would one day be working on the same steam engine I used to see as a child. When the engine went out of service, its return was uncertain. Because I'm so rooted in this community, I've got a lot invested in this project. I'm proud to be part of its return. Why ride the steam over the diesel? Marshal: #1702 is history revived! It represents a time when man powered engineering was at its height and the US was a war. 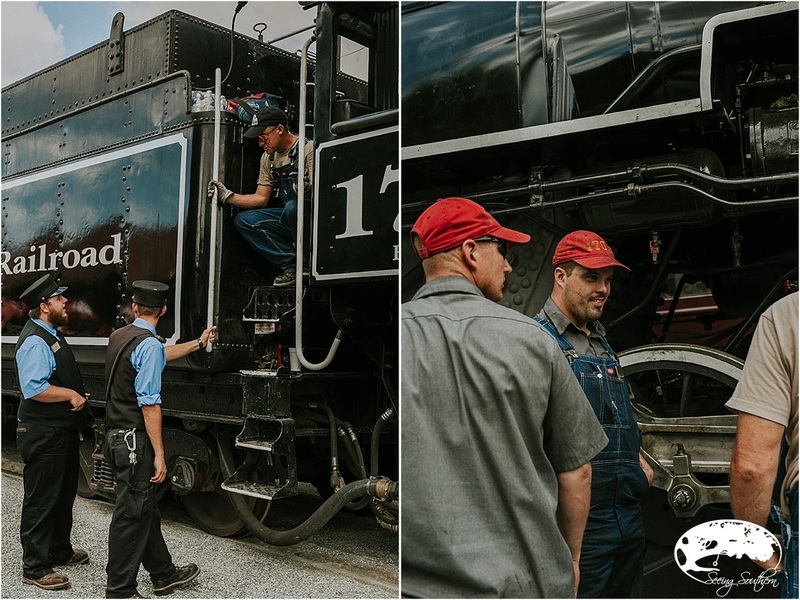 Marshal: The most fun was the excitement knowing we were bringing this locomotive back after 12 years. To its former glory, better than ever. Brian: My favorite part of this entire process was the first time all of our hard work finally paid off and #1702 was entirely operational on her own. That was an exciting day here at the shop. Just beyond the depot in Bryson City is the turntable. 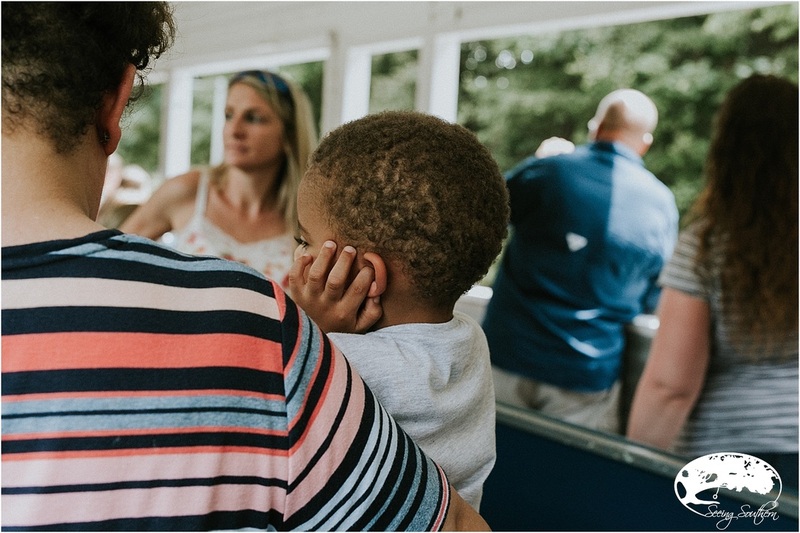 When you come to ride the steam powered train, don't miss out on watching it turn around. This turntable - a way of turning the locomotive around for its return trip - was led by Tom Falicon, project manager. As crowds gather, the workers enlist three to five people to move this mammoth engine. The turntable is so perfectly balanced that all it takes it the manpower of eight people. Four on one side, four on the other, and she's back in the lead. Don't miss this! visit its website for pricing and scheduling. For fall foliage and specialty excursions like the polar express, book early.